Developed in the 70s, magnetic resonance imaging has been gaining popularity in the last two decades, as the improvement of its technology has enabled reductions in cost and greater patient comfort during the examination. In this article we explain how is the MRI, what are your contraindications and what is the necessary preparation. In most cases, no need no special preparation for performing a nuclear magnetic resonance imaging. The only basic care is to prevent the patient from the machine carrying something metal can, during the examination, an extremely strong magnetic field is generated, creating a powerful magnet that can attract violently any material which is metal. To get an idea of the magnetic force generated, a metal chair or even an oxygen tank can turn into projectiles being drawn towards the machine. Among the personal items that should be removed before the NMR examination are wallet, watch, earrings, rings, dentures, hearing aids, glasses, hair clips, etc. In general, the safest thing is to let the patient only with underwear (bra wire can not be used) and dress him with an apron provided by the clinic. Most MRI machines also are tunnel-shaped, with an opening at both ends. The patient lies down on a stretcher moving toward the inside of the unit at the time of examination. The procedure lasts 15 to 90 minutes, depending on the size of the area to be covered and the number of images needed for the study. During the examination, the patient needs to remain still so that the images do not come out blurry or out of focus. MRI is a painless examination, but the fact of the patient having to lie still inside a tunnel closed for several minutes can be extremely distressing to some people. There are already open machines, as exemplified in the image below, but in general, they are less powerful and do not usually produce images with resolution as good as the closed machines. The MRI machine is also often too noisy, which can contribute to the malaise within the same. To reduce the noise nuisance, ear protection will be provided. Some clinics provide headphones for listening to music the patient during the process. Claustrophobic and / or anxious children and people need to be sedated to achieve remain motionless inside the MRI scanner. In most cases, the coach usually leaves the patient's hand a kind of control that can be triggered if you need to communicate during the exam. 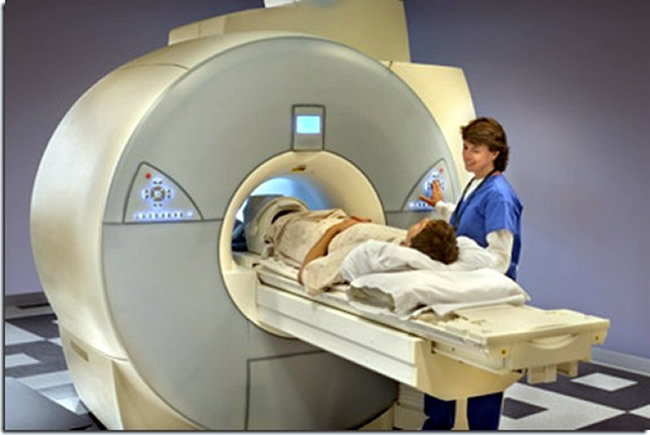 MRI is currently the imaging test that provides us with the sharpest images of the human body. If it was a cheap and easy test to be carried out, it would probably be the first imaging test of choice in most cases. But this is not the current reality. Despite the NMR be far superior to conventional radiography and ultrasonography, these tests are much cheaper and easy to be realized. A simple enough to identify a ray and ultrasound pneumonia is more than adequate in most cases to identify gall stones or kidney. Therefore, the use of magnetic resonance just being restricted to cases where other imaging can not be sufficiently good. Currently, MRI has been used for the whole body, but it is especially important in Neurology and Orthopedics. MRI images usually provide information to the brain, the spine, ligaments and joints, other imaging tests are not capable. The study of blood vessels has also been increasingly realized with magnetic resonance angiography called in this case. In recent years, the evaluation of the heart and its vessels by NMR has also evolved significantly. You have to use in contrast MRI? Not all MRI contrast needs, especially those made in the orthopedic area. In most cases, however, the contrast administration, be it orally or intravenously, greatly improves the quality of the images provided. The contrast used in NMR often based on gadolinium which is a rare metal. The gadolinium is in contrast to low frequency side effects, including rare occurrence of allergic reactions. As the contrast of NMR contains iodine, it is safer than most contrasts used intravenously. The large gadolinium problem is that it is extremely toxic for patients with advanced renal failure, especially for those with creatinine clearance below 30 ml / min. In this group of patients, gadolinium administration may cause a serious complication called nephrogenic systemic fibrosis. The vast majority of people can undergo the MRI scan without any risk to your health. There are some special situations, however, which may prevent the realization of the exam. The most common situation is when the patient has a metallic device that can be influenced by the powerful magnetic field generated by the MRI machine. Fragments of metals in the body (such as firearm projectiles). Tattoos (formerly the paint had trace metals). Not all devices listed above contraindicate the realization of NMR. For example, implanted stents or vascular grafts for more than 6 weeks usually be safe. Also there are already pacemakers that can be used in resonance. However, it is always important to inform the medical staff about any artificial device present in the body, so they can safely decide which situations are risky and which are safe. Orthodontic prosthesis (tooth devices) are not usually a problem, but can hinder the quality of the generated image. MRI is better than CT scan? Nuclear magnetic resonance (NMR) and computed tomography (CT) scans are of similar effectiveness. In some situations, the TC is often the preferred technique, while in others, the NMR is the method that provides more information. For example, the search bone injuries, lung disease and screening of malignant tumors are usually made by CT. Traumatic situations, which require a faster diagnosis of internal injuries, are also usually investigated by tomography, which is a test that demands less time MRI to get ready. For the same reason, patients with suspected intracranial hemorrhage should also be evaluated preferably by CT. MRI is the modality of choice for research ligament and tendon injuries to spinal problems to tumors of the central nervous system to research of neurological diseases such as multiple sclerosis. CT examination is carried out much more quickly than NMR, becoming the study of choice in cases of trauma or other acute neurological emergencies. The cost of a CT scan is considerably smaller than the NMR. CT is less sensitive to patient motion during the examination, since the image can be obtained more quickly. CT may be easier to accomplish in claustrophobic patients. CT devices usually hold better morbidly obese patients. CT can be performed without any risk to the patient with implantable medical devices such as cardiac pacemakers or ferromagnetic vascular clips. MRI does not use ionizing radiation (x-ray) and therefore preferable to CT in children, pregnant women and patients who need imaging tests repeatedly. So far not identified any side effects or damage to health from exposure to the magnetic field and radio waves generated by NMR. NMR has a much wider range of contrasts available for soft tissue anatomy depicts in more detail and is more sensitive and specific for abnormalities within the brain. MRI is able to generate images on several levels and can rebuild organs and anatomical regions in 3D. The contrasts used in NMR have a considerably lower risk of causing severe allergic reaction.